Bortner Bros., Inc. has the resources to provide and install complete air handling systems to commercial, industrial, institutional and medical facility customers. 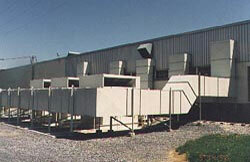 We provide new HVAC systems during building construction or renovations to existing facilities. 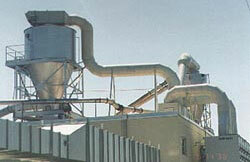 The majority of the ductwork distribution systems that we install are fabricated in our sheet metal shop. Bortner Bros., Inc has the knowledge and experience to install various air handling, make up air and ventilation equipment. We can provide chilled water, hot water and steam piping systems. Our experience includes chillers, cooling towers, rooftop package units, split system air conditioning equipment, dust removal systems, computer room air conditioning, heat exchangers, geo-thermal systems, radiant heat systems, humidification and dehumidification equipment and natatorium climate control. Multiple air handling units with ductwork for trim paper collection system at Standard Register in York. Bortner Brothers provided all associated equipment, piping, supports, control wiring and equipment start-up.